Lady Eve Balfour (1898 – 1990) is best known as the founder of The Soil Association, Britain's leading organic food and farming organisation. The Soil Association was born in 1946, following publication of Lady Eve Balfour's bestselling book about organic agriculture, The Living Soil (Faber & Faber 1943). Born into one of Britain's most important political families, the Balfours of Whittingehame, East Lothian, Eve Balfour decided at a young age that she wanted to become a farmer. 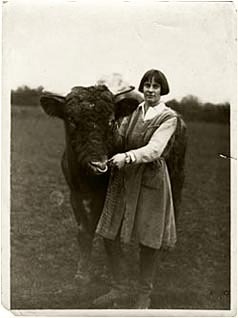 She trained at Reading University College during the First World War and after briefly managing a hill farm in Wales, Eve and her sister Mary bought a farm in Suffolk. Eve farmed throughout the economically difficult inter-war period. New Bells Farm was a mixed farm, boasting arable crops, a dairy herd, sheep and, at times, pigs. In addition to farming, Eve found time to sail to Norway, play in a dance band and co-author three detective novels. 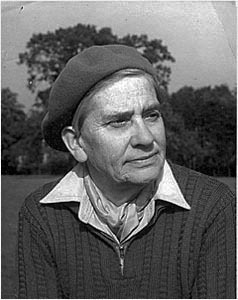 In the early 1930s Eve Balfour became a high-profile campaigner in the tithe protest movement, which saw financially-strapped farmers attack the Church of England for its continued reliance on tithe payments to supplement the income of rural clergy. In 1938, Eve Balfour encountered ideas about compost-based farming and lost no time developing plans to put organic agricultural concepts to the test by conducting a farm-based experiment on her own land in Suffolk. Following publication of The Living Soil and establishment of The Soil Association, Eve Balfour became one of organic farming's most important and determined campaigners. During the 1950s, she travelled to North America, Australia, New Zealand and many European countries, spreading the organic message and creating networks of supporters. She was also involved in the early days of the International Federation of Organic Agricultural Movements (IFOAM). A copy of Erin Gill's 2010 PhD thesis 'Lady Eve Balfour and the British organic food and farming movement' [pdf] can be obtained by filling in the following form and clicking through to a download.